Two different themes coincide here today, both embedded in days of yore yet each bearing a vivid, contemporary context. A first message arrived in Roamer’s mailbox on Wednesday accompanied by some evocative old photographs. If anyone knows anything about the old ferry, and what it was like to travel on her, please send your thoughts and accounts, and pictures if you have them, to Roamer’s address shown below. Portrush Harbour was built around 1827, and with the advent of the railway, the small fishing village began a rapid expansion into a popular resort and port. All that I’ve discovered so far about the Ardrossan ferry is that it began between Ardrossan and Brodick on the Isle of Arran in 1834, a service to Belfast started in 1884 and a service to the Isle of Man was introduced in 1892. Built by Fairfield Shipbuilding and Engineering Co Ltd, Govan, and designed for the Ardrossan/Portrush service, the 1,241-ton, steel, twin-screw, passenger/cargo steamer SS Hazel was launched on April 13, 1907. Her first owner was the Laird Line Ltd of Glasgow and she operated a daily daylight crossing between Portrush and Ardrossan, as the emailer outlined. At the onset of the First World War SS Hazel was transferred to the Admiralty as an Armed Boarding vessel and had a considerable the First World War sea-record. In 1919, renamed SS Mona, she was transferred back to her original owners but the burgeoning trouble in Ireland led to her sale to the Isle of Man. On July 2, 1930, SS Mona ran ashore on the Conister Rock in Douglas Bay, an accident that caused the outer face of the Victoria Pier to be painted white thereafter in order to make it more visible. Mona was sold to Edgar Rees of Llanelli and was broken up in November 1938. I very much hope that more readers’ information will add to the Scotch Boat’s story here in the near future. The second theme today from times past relates once again to Mary Poppins, mentioned here at the beginning of the month. Regular readers will remember photographs on the Friday, March 1 showing the 57-year-old poet, painter and writer George William ‘AE’ Russell with his arm around the 25-year-old author of Mary Poppins – Pamela Travers. There was also an extract from Travers’ first story about Poppins and the Match-Man in, co-incidentally, the Christchurch Sun newspaper in New Zealand. Very tragically, the renamed Christchurch Star newspaper is carrying an infinitely contrasting story today, and our thoughts are with that far-away nation in grieving, as they are with people at home too. 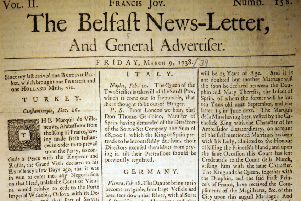 Roamer’s page at the beginning of March outlined Lurgan-born AE Russell’s friendship with Travers, and how he inspired her to write and publish her Mary Poppins stories. Portadown-based historian Brian McKernan, after discovering the Russell family grave in St Mark’s graveyard in Armagh, shared the story here about AE’s remarkable relationship with Travers that began in 1924 and led to the first appearance in print of the world’s most famous singing nanny! Next month, from Monday, April 8 until Saturday 13 the third AE Russell Festival is being held in Lurgan and Armagh marking the date of Russell’s birth – April 10, 1867. I promised more details here from the festival programme, which are also on the Lurgan and North Armagh George Russell Festival Society’s Facebook page, a wonderful page set up to celebrate the absolute genius that was AE Russell. There’s a post on the page that says it all – “more people should know about this great artist and writer who was way ahead of his time and has never had the recognition he deserved. It’s almost as if he foresaw the current tangle over Brexit when AE wrote in 1911: “I think we do right to expect great things from the state, but we ought to expect still greater things from ourselves. “I would a thousand times rather dwell on what men and women working together may do than on what may result from majorities at Westminster. The festival launch is in Brownlow House in Lurgan at 3pm on Monday, April 8, where a special AE Exhibition runs until the April 11. 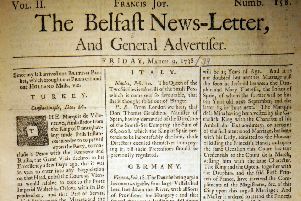 There’s also a talk about Russell in St Peter’s Parochial Hall in Lurgan on the evening of April 8, and another talk in Lurgan Library on the Tuesday night, entitled Four Famous Lurgan People. There’s an open mic night, a traditional music night, and numerous guided walks and talks – all in Lurgan – while the AE Collection Exhibition runs in Armagh County Museum from Monday, April 8 to Saturday 13.